In the light of the latest animal use numbers in Germany (2017), Bart and I are having a conversation about animal use in fundamental research. We then move on to talk about a new statistical method that might help researchers get some of their data out of their drawers and into an article! 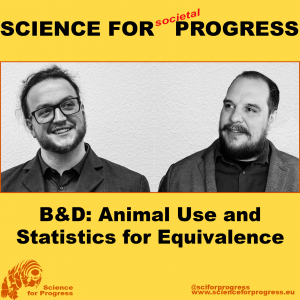 Bart and I regularly discuss the merit of animal research on social media, and we also had a podcast episode on animal wellfare in science. Our conversation mostly is about fundamental scientific research – which is what we do. We talk about how scientists don’t prefer animal experiments, if there are better ways to answer the research question. But we also mention how difficult it is to know in advance what the outcomes of a study will be good for, particularly in fundamental research. We then address the ethical considerations of the value we assign to different animals. The statistical tests usually applied in scientific studies look at the data of two or more groups and check whether they are different enough to say that there is an effect between them. It appears that often lack of such differences is used as an argument against publishing the data at all. Because of this, experiments may be repeated unnecessarily by different groups, simply because they don’t know about the results. The paper that Bart highlights is “A new statistical method to test equivalence: an application in male and female eastern bluebird song” by Rose et al, 2018 (link below). In order to show that the songs of male and female Eastern Bluebirds are not just not significantly different, but identical, they applied this new statistical method. This may allow scientists to pick up some of their old studies and publish them!